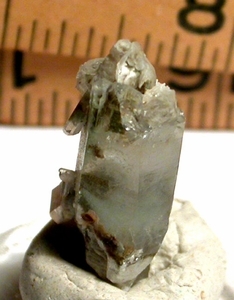 Cluster-topped green chlorite Arkansas phantom crystal actually has two separate phantoms and several inclusions as well as white titanum veils. The cluster members have green phantoms as well as sparkling drusy, too. A great study or small pendant specimen, it's overall1/2x 1-1/8" tall. [Thumbnail] From Garland County.